Harvey Dent is the latest iconic DC comics character to make his presence felt on FOX’s hit series Gotham. 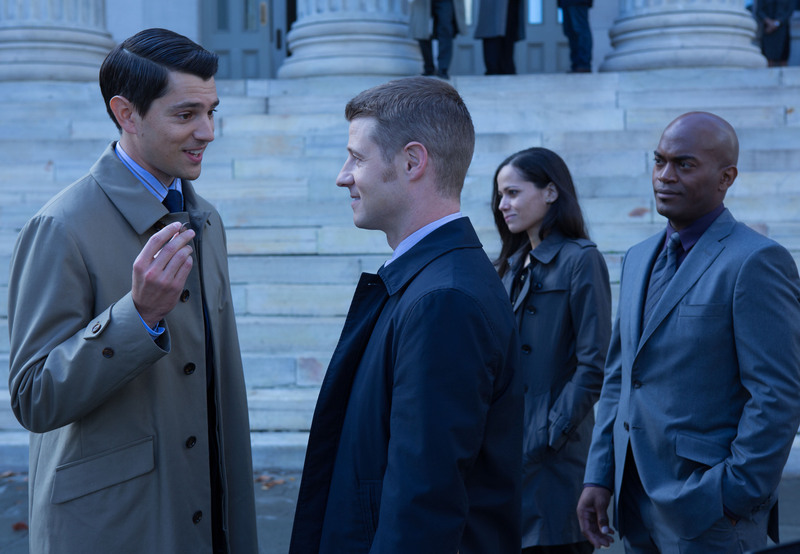 The episode will spotlight the young District Attorney as he encourages Gordon (Ben McKenzie) to team up with Mayor James (Richard Kind) in an attempt to close the Wayne murder case. But Dent (future Gotham villain Two-Face) hides a traumatic past and a “merciless, rage-filled core,” behind his sympathetic exterior according to D’Agosto. The actor sat down with ScreenSpy this week to talk about his version of Dent/Two-Face, his character’s troubled backstory and the pressures of working with such well known material. Read on for full highlights from our call below. Q. Can you describe your first day on set? Q. What can you tease about Harvey Dent’s first appearance on Gotham? ND: The thing about Harvey Dent is you’ll see that he’s not the moral center that Jim Gordon is, but I do think that he’ll be a breath of fresh air. Gordon needs like a teammate that he can trust, and I think he needs somebody else on his side, and I hope that people will enjoy the idea of seeing these two guys in their different ways of approaching it, creating this kind of allied chip. Q. What do you bring to this iconic role? ND: I would say that, for good or ill, I guess I’m a really ambitious, merciless, rage-filled guy. I would say that ultimately what I bring to this role and what this role was kind of requiring was someone that can be a kind and genuine and sincere person, a sympathetic character; and at the same time someone who’s ambition can bring them into areas that maybe could potentially cross a line. The actor can bring what they can from other iterations of the franchise, but at the end of the day they’ve just got to play what’s in front of them, play what’s on the page. What was on this page was a real ambition for this guy – to the point of being almost a little reckless. And he puts himself in a position where he puts a lot on the line. Some of the things that come out of that foreshadow who he will eventually be – the potential that he has to become Two-Face later. Q. What’s the most important thing you feel you need to convey with your performance? ND: I think a lot of actors fight this – I certainly fight it – the tendency to want to show the capacity for being. In this case it would be the capacity for being Two-Face. I think the most important thing I had to do, and I did this with the help of the directors and producers and everybody around as we, at the 11th hour, sculpted the beginning of this guy. I think it was really important for me to just be smooth and easy and likeable and things roll off my back, you know? He gets himself involved in some pretty intense, high-stakes situations.He kind of walks right in like a loaded gun. He presents [himself] to Gordon, and they go off on this attempt together. I like how vague I’m being. I would say that the most important thing for me to do in that is to show his confidence and his ease in these situations. I think it’s tempting to want to play the kind of bolder emotions, and those are definitely there, but they’re more fun if they’re a surprise. ND: They talk about him being abused as a child and that he had these, maybe, psychotic episodes as a child that kind of foreshadow his capacity to become someone like Two-Face later. What I think was really good about that was that drives him to want to eradicate this type of behavior, and also why he has the potential to have such a visceral response to when he’s threatened or when he sees someone that he thinks is also abusive, because it’s this—you know, it’s because that relationship that we have to our parents is so irrational, and I think it’s important that this character has this capability, this capacity to be really rational. And although he’s mostly Harvey Dent right now, he has, under the surface, these things. That’s the thing that I was able to pull, that was really valuable for me. Q. Was there pressure coming onto the show, knowing that fans and other actors want Harvey Dent on Gotham? ND: You know, you can’t get too wrapped into it. Thankfully I’ve had enough experience with bad reviews in the past that I feel like that I can place that kind of stuff in the right compartment, but I think, yes, I’m a fan of Batman, and I’m a fan of these franchises, and I read comics, and so I definitely am sympathetic to people that want this show to live up to their expectations. Obviously the difficult thing about expectations is that everybody has different ones, and it’s difficult to assuage everyone. I can tell you one thing, actually, that I really debated. In every version of every picture I saw of Harvey Dent as Two-Face, he’s holding the gun in his right hand and he’s flipping the coin in his left. But I’m right handed. It’s difficult to flip a coin that —sort of like rubbing your stomach and patting your head when you’re in the middle of a scene, and I was a little bit intimidated by the idea of using my less dominant hand, because if I ever dropped the coin the take is ruined. So, I wanted to make sure that if every picture was Two-Face with the coin in his left hand, well darn it, I was going to put that coin in my left hand. So, I practiced all weekend, talking and flipping the coin, and I did all right, thankfully. So, I feel pretty good about it. 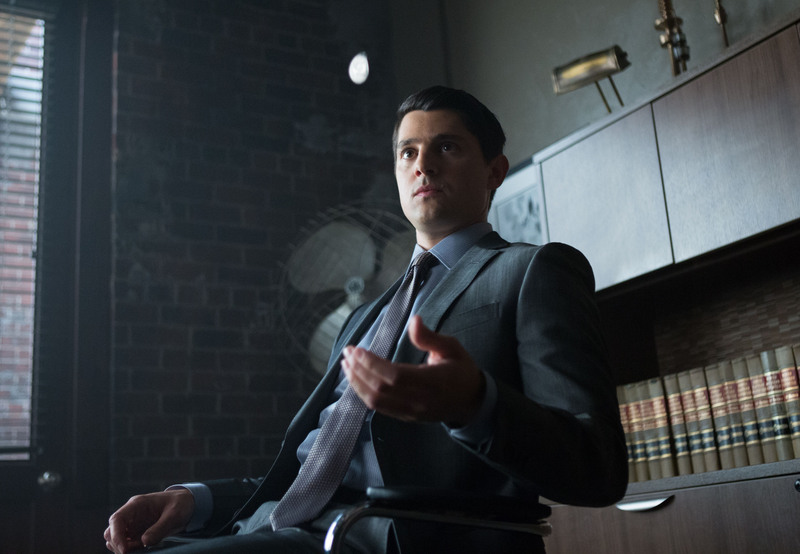 You can catch Nicholas D’Agosto’s first appearance in Gotham’s “Harvey Dent” Monday, Nov. 17 (8:00-9:00 PM ET/PT) on FOX. Follow @ScreenSpy on Twitter | ScreenSpy on Facebook for more Gotham scoop and interviews.